It's been raining a lot and I am yet to be sure whether or not I like this rainy season. I definitely enjoy the wind balancing the striking sunshine, but cannot bear having to choose between putting an indefinite pause to my activities and risking my hair and clothes to be soaked. Not to mention how London would not be able to go out and play. A wee bright side on a fashion note is that I get to wear my sweaters again! Not sure what inspired me but sweater over dress is an alluring combo I like to hit these days when the clouds come on. ps - upcoming giveaway hint: how many of my readers are fashionable bookworms? Hi! I love this outfit!! Amazing! I hope you'll consider to have a look on my blog. love it! the picture's are so beautiful! you look excelent! lovelovelove it. Love the floral skirt and that jumper over it.. cute! Oh and yes im definitely a bookworm, cant wait for the giveaway hehe! i love the mixture of patterns! great look .. i love this sweater! I love wearing sweater over dress too! Oooh, that floral dress is just so pretty, love that print! I love the mix of patterns and fabrics ! Very nice blog ! i love it!! beautiful print! Cute look! Love your sweater, and the florals go really nicely with it. Thanks for stopping by! :) Visit me anytime again, it would be lovely x Have a nice Sunday! Love your dress -- super pretty! Thank you for your comment) Follow me on bloglovin please))! your dress is adorable! and adding the sweater is a great touch. I thought it was a short!! btw you look gorgeous!! cute outfit! charming sweater & lovely dress! I love this outfit! The prints together are perfection and I love the colours too! Thanks so much for stopping by and commenting on my blog. It means so much! I totally totally totally love the dress. The print is gorgeous! pretty outfit, and gorgeous photos! Adorable outfit, love your skirt! I love this combination! So cool and unexpected! Cute dress! Love this outfit! Loving the clashing prints, the sweater is lovely. Very cool look and beautiful photos! this is a really cute combo! cute sweater. 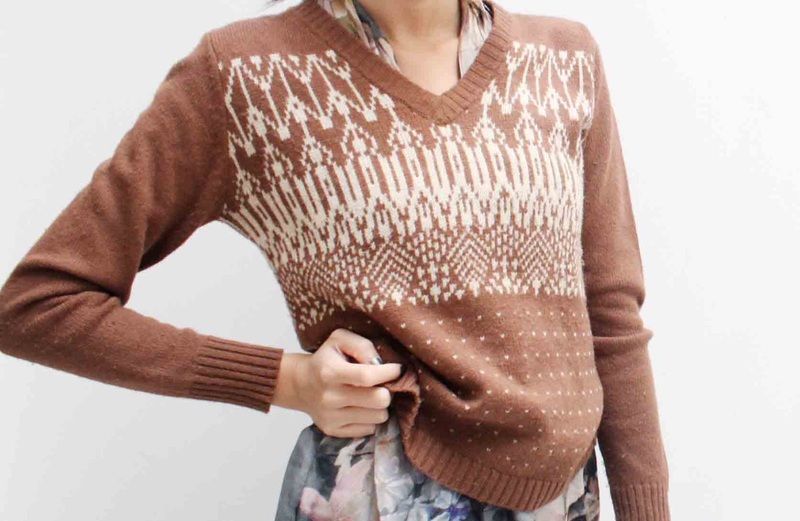 That is the perfect transitional sweater!So cool!! !